One of David Bordwell's contentions in The Way Hollywood Tells It was that the post-modern storytelling associated with contemporary cinema has its roots in the classical Hollywood era. Bordwell expands on that theme in his latest book, the encyclopedic Reinventing Hollywood: How 1940s Filmmakers Changed Movie Storytelling, released this month. Reinventing Hollywood is a continuation of The Way Hollywood Tells It, bookended by chapters called "The Way Hollywood Told It" and "The Way Hollywood Keeps Telling It". Bordwell identifies a variety of narrative experiments, including voice-over, flashbacks, alternate perspectives, and dream sequences (also discussed in a chapter of Film Noir: Light and Shadow), culminating in "Artifice in Excelsis", a chapter on self-reflexive cinema. There is one auteurist chapter, on Alfred Hitchcock and Orson Welles ("The Lessons of the Masters"), though Bordwell finds innovation in an impressive range of films, not only the established canon. 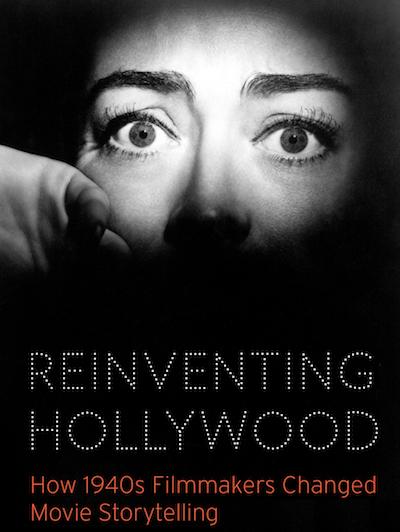 Reinventing Hollywood is concerned with how cinematic stories are told, rather than what they look like, though stylistic analysis can be found in Film Art: An Introduction (by Bordwell and Kristin Thompson) and The Classical Hollywood Cinema: Film Style and Mode of Production to 1960 (by Bordwell, Thompson, and Janet Staiger). Boom and Bust: American Cinema in the 1940s, edited by Thomas Schatz, covers the changes in the film industry during that decade.